Before kids, my husband and I traveled internationally quite a bit, but with a one year old daughter and three year old son, travel was starting to feel like too much trouble with car seats, diapers, etc. The answer seemed to be to go on organized tours that pick you up at the airport and take you from spot to spot so you don’t have to worry about planning meals and lodging. The problem was that no tours we found were geared towards families with kids under 5, or even under 8! Also, the pace of most tours is too fast and many of the scheduled activities can’t be done with a toddler or baby and are no fun for preschoolers or elementary school children. I decided to start my own tour company, escorting small groups of grandparents, parents and friends with children ages one through seven. As our kids have grown, I’ve learned more and continued to add more itineraries and activities so that we have tours now that work great for babies up to teens. My goal is to design nature-based tours that are fun, support the local communities that we visit, and go at a pace that the whole family can enjoy including time for naps, snacks and run-around breaks. I know Costa Rica well and have planned the tours to avoid the overpriced and overcrowded tourist trap areas so that our groups can experience the real Costa Rica. Instead of the frenzied pace of traditional tours, we’ll stay at least two nights in a row at each location. Families can choose from three types of lodging. I started with eco-Tico lodges: small, friendly family-run lodges with home cooked meals that are flexible enough to make peanut butter sandwiches for the kids! Later I added eco-Plus and eco-Upgrade lodges for families who’d like more amenities. I lived in Costa Rica for a year in 1995 teaching English and Environmental Education to 1-3 graders. I visited nearly every national park, nature reserve and tourist destination during weekends and vacations. I returned nearly every summer until my son Max was born guiding 3 week Tropical Ecology field courses for Duke University, leading a private custom tour or just vacationing. My husband worked as an adventure wilderness backpacking/biking tour guide in Iceland and Alaska before he moved to the United States. We traveled to the Netherlands with Max when he was 6 weeks old and to the Galapagos Islands/Machu Picchu when he was 7 months old and have taken numerous international and home-country trips with both children so we understand what is required to make a trip smooth and fun with little ones. Check out my Costa Rica blog post on the Travel Savvy Mom website and the Travel Tale I wrote for the Family Travel Forum website. After 3 1/2 years in the Netherlands (2007-2011), we’re enjoying life in Minnesota again. I’m not leading tours myself anymore now that my kids are in school, but I am still busy planning tours with wonderful bilingual Costa Rican guides for families who’d like to visit Costa Rica. I try to get to Costa Rica once a year to check out new locations, lodges and activities. If you’d like more information on our trips to Costa Rica, please explore our website or send me an email (Click on “Contact Us” above). Thanks! Jenny Jensen has a long history of interest in the environment, ecotourism and Costa Rica. She has a Bachelor’s degree from Brown University and a Master’s degree from Duke University in Environmental Science. While at Duke, she took additional courses in Ecotourism and Medicine for the Third World Traveler. She spent a year in Costa Rica as a volunteer English and Environmental Education teacher for first through third graders and hiked nearly every trail in the country during her free time. While at Duke, she led Tropical Ecology educational tours of Costa Rica for the University’s Talent Identification Program (TIP), a summer program for gifted high school students. She traveled to Costa Rica several other times, designing custom tours for friends and family. Jenny worked in environmental compliance and enforcement at the Minnesota Pollution Control Agency for 7 years. She’s currently working for the state of Minnesota and planning trips in her spare time. 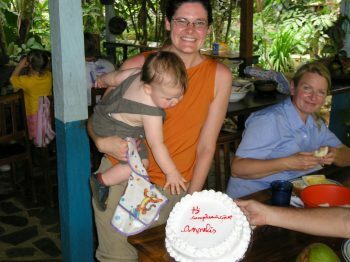 The picture here is from Annelies’ first birthday at Andrea Cristina B&B in Sarapiqui, Costa Rica.